Gail Penberthy has done it again with this magnificent farmyard fleece quilt. 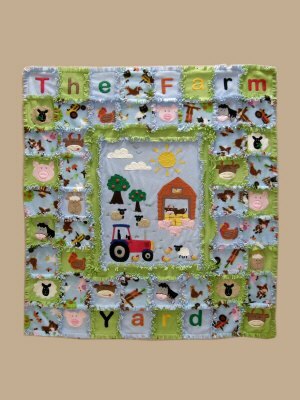 This is the latest one in a fun series and at last a quilt that is ideal for boys as well as girls, as it has all of the farm animals appliqued onto the fleece squares. It is easy to make and the pattern includes all of the instructions and templates. Finished size 56 x 50 inches.